Thanks it’s a great tool! One more question concerning the number of user arps that fit into 1 file … When you combine the user arps of 3 voice sets, it’s too big for 1 file (just 256). From each user arp file I just need like 10-20 arp patterns … but how can I combine these selections? When a soundbank with user arps is loaded, is it possible to ‘delete’ user arps that you don’t need in the combinated user arp file? I stored a performance in pattern mode and added the pattern (from a saved all patterns file) to my favorite setup. In pattern mode it works fine. Then I saved the track to (user) arp. But this user arp won’t work in voice mode. It is a drum/ percussion voice that is in the user voice bank (not user drum bank) so maybe it has to do with the nature of the arp? (kind of a percussion kit with phrases....)...? Thanks it’s a great tool! One more question concerning the number of user arps that fit into 1 file … When you combine the user arps of 3 voice sets, it’s too big for 1 file (just 256). From each user arp file I just need like 10-20 arp patterns … but how can I combine these selections? Arps-Plus wasn’t designed to edit which Arps from a library will be merged - it combines all of them from the selected files. The limit of 256 is the maximum number of User Arp locations in the Motif. As I mentioned in my first post of this thread, there is commercial software that will do more. 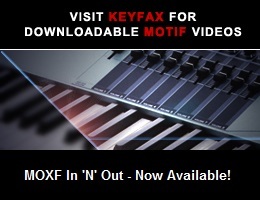 For your purposes, you might consider purchasing the Motif Waveform Editor from John Melas. It will allow you to rearrange Arps and delete unwanted ones. - save ‘all arpeggio file’ and ‘all’ file. I think this must work too (bit elaborate through...) ...?